Linda Darling-Hammond is something of a ninja in education policy. 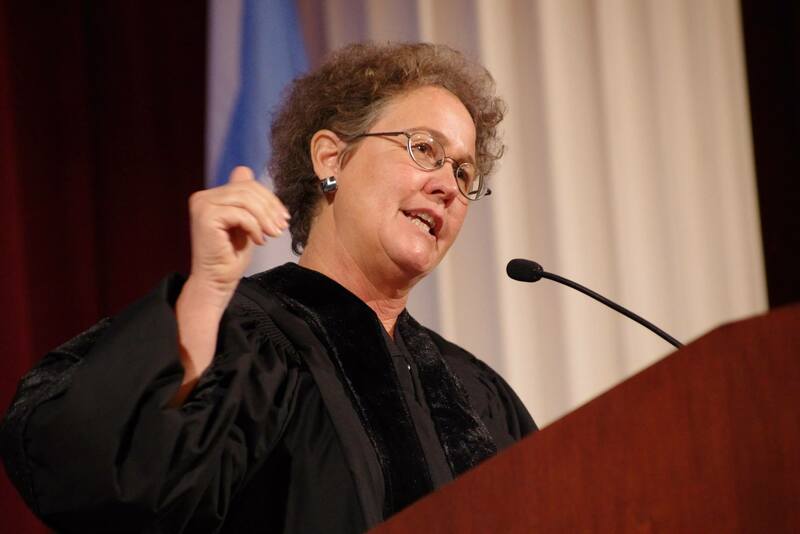 She founded and currently leads the Learning Policy Institute in Palo Alto, Calif, and is a professor emeritus of education at Stanford University. She also founded the Stanford Center for Opportunity Policy in Education and helped redesign the Stanford Teacher Education Program. After President Barack Obama was elected, she headed the transition team on education policy. Outside of education, Darling-Hammond has a dizzying array of talents and interests—from playing classical piano, to rattling off long number sequences, to a past addiction to soap operas. She is a devoted mother to her three children, including Sean Darling-Hammond, a Washington DC-based attorney, nicknamed “The Giving Ninja,” who will be competing in Philadelphia next Thursday in American Ninja Warrior. Sean’s goal? Winning the Ninja title and the top prize of $1 million so he can donate it to organizations expanding educational opportunities. Linda’s goal? Make the education America provides to all its children equitable, transparent and focused on delivering 21st century innovations in learning, teaching and schooling. EdSurge: What’s your perspective on where the US education system is now? Darling-Hammond: First of all, we are about 15 years behind some other industrialized countries in really engaging with 21st century learning skills. We were pursuing these changes in the 1990s, but No Child Left Behind took us on a long detour. Because of the focus on high-stakes tests, it emphasized low-level skills, particularly in schools that were already struggling by threatening them with sanctions. The rule of the day became rote learning, with a drill-and-kill orientation. Instead, we need to be focused on building up students’ problem-solving skills, their critical thinking capabilities, and their deep understanding of content so they can apply that knowledge in new situations. Second, and in tandem with that issue, have been equity issues. The access to this kind of deeper learning and 21st century learning has been least available to the growing number of schools that serve children in poverty. The equity dimensions of this problem are growing larger. We’ve long had inequitable practices in how we fund schools and communities. That’s gotten worse in the past 15 years. The “safety net” for kids in poverty has become increasingly tattered. We have to support all the children and families in this country and make sure the learning opportunities they have will help them be successful. The problems to be solved are so very, very widespread. Do you see positive examples in the U.S. today? Some of the schools organized around 21st century skills that come to mind are Envision Public schools, the public schools developed by the Asia Society, New Tech High and High Tech High. The state of New Hampshire has also taken on these issues with its focus on competency-based education. We certainly see elements of this in redesigned schools in New York City, Chicago and Los Angeles, so there are island of excellence. Our job is to turn those islands into a total landscape. It can start with changes in federal policies. The new rules and state plans that will follow the Every Student Succeeds Act (ESSA) could become punitive if they rely on a test-based approach with sanctions—or they could become a lever for positive educational change. Then we need every state to develop a plan that prioritizes 21st century learning. We need professional development on a very large scale so teachers can learn the new pedagogies. And we need changes in school funding laws to provide equitable resources to implement these new standards. We’ll also need a great infusion of technology. We haven’t had a strong federal investment in computers in schools since the Clinton Administration. Many districts are still spending less today than they did in 2007. And in low-income schools, investment in technology and instructional specialists get cut. So we do need some major investments. By ‘investment in computers,’ do you mean investment in technology broadly? When I think about technology, it’s not just computer hardware—that technology changes so rapidly. It’s about connectivity—the lack of bandwidth that still plagues low-income areas—and the software that allows kids to use the technology in productive ways. And it also means more tech training for teachers and technology specialists so they can support the use of technology. We did a study a couple of years ago on what kind of technology uses are most effective for at-risk students. What we saw was that using computer like an electronic workbook to be self-taught does not raise achievement. But using the computer with the help of the teacher, to promote engagements with peers, to support inquiry into content and to create projects such as a museum display or website that explores a problem, does support learning. Skillfully done, technology can create very large gains in achievement. So you need that kind of approach. You also need to support teachers so that they use the technology in those ways. And you need the resources at hand to do it. Some of the places that are most exciting—like High Tech High or New Tech High, where kids are using the tools in creative projects and engaging with their colleagues in the design of new ideas and products—are really displaying what 21st century learning is all about. Knowledge is expanding at such a rapid rate—and we have to prepare them in only 12 years of learning. Our kids are going to have to work with knowledge that hasn’t been discovered yet, and tech that haven’t been invented yet. These kinds of learning opportunities—where kids can use powerful tools to tackle specific problems and develop problem-solving skills—are what will lead us to the productive, creative future that America has always been known for.